HandKrafted by Stephanie: Mojo 292: Thanks for Being Awesome! Mojo 292: Thanks for Being Awesome! Hello! It's time for another Mojo Monday sketch (#292)! It's the first sketch of the month, so that means it is Mojo Contest Week! Play along for a chance to win some Verve stamps! Today's sketch is brought to us by Julee. I made this card for Sabrina's ballet teacher, who unfortunately will be leaving us soon as she is relocating. I used Happy Hello for my sentiment. Accessories: A Cut Above Dies: Flag It Die Set, Pennant Trim (Verve); Standard Circle Nestabilities - SM, LG (Spellbinders); Brad (Simple Stories), Foam tape, Thread, Sewing machine. Gorgeous combination of colors! A special going away card - she will love it! Your card is gorgeous. Love that brad. Lovely card! The papers, stitching, black details and wonderful sentiment all work very well together. Very pretty! Great colors and papers. Very pretty card. So pretty Stephanie! 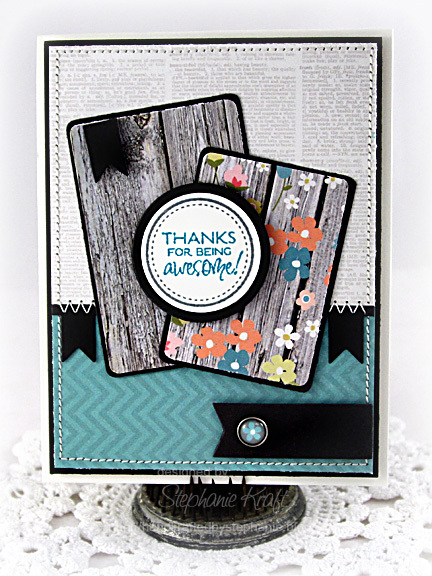 Love the framed sentiment and mix of patterned papers! What a beautiful card! I'm you're newest follower! Come and follow me if you get a chance!